I consider this among the very best card books ever written - and I have read an awful lot of card books. You might ask why a rather thin work from the 1980s would qualify for that high praise? There are three very good reasons for it. One, Walt Lees has selected four absolute gems of card magic. He could have added fifteen other ok routines to make it look a lot more, but he has refused to pad his work with mediocre material. Good for him. There is already enough mediocre material published. It makes it a lot easier for the reader. You do not have to look for the gems. They are already right there in plain sight. Two, he describes these routines in minute detail, because he tells you not only what to do, but also how to do it. These details, nuances and subtleties, often just a small movement, gesture, look or pause, are where the performer distinguishes himself from the mere trickster. If you study these carefully you will be able to apply the principles to many other tricks you do. Three, Walt has a most funny self-deprecating humor. I don't remember reading anything like it in a long time. Even if you hate card tricks, you might just read it for the humor. 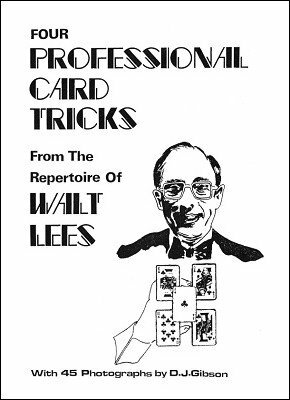 The equally great sequel to this publication is More Professional Card Tricks . 1st edition 1981, 36 pages.